Talib Kweli will host a special edition of Bowl Train at the Brooklyn Bowl for his Radio Silence Album Release Extravaganza on Thursday, November 16th. 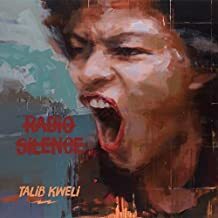 Four years in the making, Radio Silence speaks directly to Kweli's desire to never be silenced. The album, released through his Javotti Media label, features appearences by Anderson. Paak, BJ The Chicago Kid, Wacka Flocka and more. Describing the album Kweli states: "In the age of information we no longer have the luxury of pretending that we can't fight bigotry and injustice in all of it's forms, whether marching in the streets or combating it online." He went on to say "silence has always been complicity, silence is death. They beg us for our silence because they cannot argue with our truth. People who ask artists to shut up and sing do not want peace, or justice. They want silence." Tickets are $10 and available online. Doors open at 11:00pm with the show set to start at 11:30pm. The Brooklyn Bowl is located at 61 Wyth Avenue in Brooklyn, New York. The event is 21 & over with valid ID. Radio Silence is available for pre-order from Javotti Media/3D via Amazon, iTunes, Apple Music as well as other preferred digital music outlets. Check out the Chris Smith directed video for Heads Up Eyes Open, the first single off the upcoming album, featuring Rick Ross & Yummy Bingham below. "This is not an album that owes its inspiration to an aesthetic, this is the sound I heard in my head." New Mixtape Celebrates The 25th Anniversary of Nas' "Illmatic"